Every business, if it has to earn profit, is involved in a fair amount of risk. Business organizations cannot grow without risks. However, some business houses are inherently more risky than the others. In case, if you are a start-up and looking for investors or you might be an established business planning to expand or upgrade your operations, the tag of being a High-Risk business will most likely scare away investors and banks respectively. Not everything is totally lost with a high risk business label; however, it does get difficult to get things going. Business needs a merchant account to accept credit cards payments and process the further transaction. Some businesses with good trading nature can easily operate and process cards online for such types of businesses owning a High Risk Merchant Account is a straightforward process. But if your business is considered high risk, obtaining a merchant account becomes challenging. In such case, you need high risk merchant account services, which are quite expensive. Traditional banks and financial institutions are wary of businesses classified as high risk and often reject such applications. Often, high-risk merchants will have to pay high-risk rates. However, we have found that we save 98% of vendors on processing fees over what they are currently experiencing whether they have low, medium or high-risk needs. Be cautious because there are many providers who will automatically approve applicants with predatory contracts and outrageous rates. Always check your contract and see if there are standards for minimizing the transaction rates. Larger reserves, rolling reserve agreements and other types of risk minimization can help an applicant obtain the best rates possible. There are a number of reasons why your business may be considered as high-risk, besides your industry type. It is important to realize which risk category your business falls into and even more important to understand why you are placed into the category to begin with. High Charge Backs: When a customer is not satisfied with the service/product or believes the business has falsely advertised their product, claims issue with the product or does not receive it at all, the customer issues a complaint with the bank and the bank initiates a refund on their behalf. This is called a charge back. Low Credit Score: Regardless of business type or industry, credit score matters. Low credit score is considered as red flag for banks and financial merchant account providers. No credit card processing history: Credit card processors may hesitate to offer their services if you are new or have a low payment processing history. A steady track record can alleviate your business off of the high risk label. A business that is listed in the MATCH list due to termination of their previous merchant processor. Bad credit history is never good for business. If you have realized that one of the above factors have labeled you a high risk business, you need to understand that not all hope is lost. There a variety of third party processors or Merchant Account Service Providers that are more than eager to work with your business. In fact, you may find certain merchant account providers that specifically provide high risk merchant account solutions for your business. A best possible solution for high-risk business merchants is to build a relationship with online payment gateways that specialize in these business types. Such payment solution companies assist you in monitoring suspicious transactions, fight charge back, identify possible threats and consistently manage your risks on a day-to-day basis. These gateways provide expertise and tools to enable merchants in running their business with a healthy account, successfully for a long period of time. Why choose our high risk merchant account services? Is your business classified as high risk? You need not worry! InternationalBankServices.com based in London, U.K. & Europe, is associated with a large number of offshore acquiring banks and large payment processors offering reliable, stable and secure payment processing for most high-risk businesses. Our rates are very competitive, unlike other high-risk payment solutions companies. Our team of experts will guide and advise you through the process and help you acquire the best possible solution for your business that benefits your unique requirements. If you are looking to obtain a merchant account but are unable to do so due to your business being labeled as high risk, you may find it difficult to get approved by merchant account providers. Generic merchant account providers reject such merchants on the account of excessive chargebacks. Hence, the approval rate for merchant account for high risk businesses is low. Want to get quick approval for your high risk merchant account? With several years of experience and strong banking relations round the world, IBS offers comprehensive high risk merchant account solutions to merchants. We specialize in high risk merchant accounts with an approval ratio of over 95% in merchant placements. 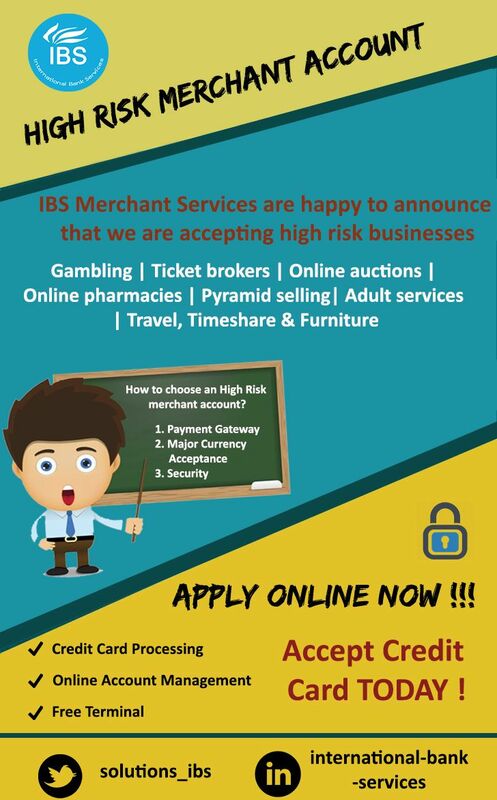 Contact InternationalBankServices.com today to know all about High Risk Merchant Account solutions for your business. We have a 24/7 strong support team and a dedicated staff that you can talk to right away to know your chances of getting approved. We are here to answer any questions you have about the process! How Do I Get Instant Approval On High Risk Merchant Account? Why are we high risk merchants?